Don’t know how to convert document of Microsoft Office word to dcx? Don’t worry, this article will give a guide to convert word to dcx with a professional tool—docPrint Document Converter Professional. In fact, docPrint Document Converter Professional which is always called docPrint Pro is consisted of three parts—GUI application which is expert in batch conversion, command line which doesn’t need to open a GUI and virtual printer which includes docPrint and docPrint PDF driver. 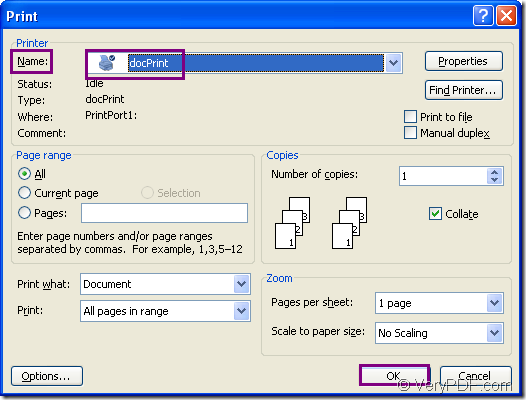 You will see how to convert word to dcx with the virtual printer docPrint in this article. docPrint is a Windows printer driver that saves ink, paper and time by controlling printed output, it supports print 2, 4, 6, 8 or 16 pages on a single sheet of paper, it also supports scale A0, A1, A2, A3 papers to standard Letter or A4 paper sizes. 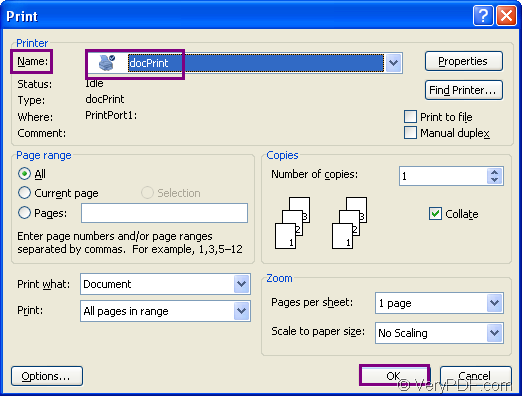 docPrint is easy-to-use, just print a document to "docPrint", you will be able to start using Document Printer software. Here are the steps for you to convert word to dcx with docPrint. Find the word document in your computer and open it to click “File” – “Print”. Then “Print” dialog box will be opened, in which you should choose the printer as “docPrint” in “Name” combo box and click “OK” button. You can see Figrue1. Press “Ctrl”+ “P” can also open the dialog box. Instead of opening the word document, you can right click the file and click “Print” in dropdown list to run docPrint if it is the default printer in your computer. Click “Save file” icon which looks like a floppy disk in the toolbar. Press “Ctrl”+ “S” at the same time. In “Save As” dialog box, which is the last dialog box in this conversion, you can follow the following steps to fulfill the process. Please see Figure3. Look for a location for the target file in your computer by clicking “Save in” combo box. Input a good name of the target file in “File name” edit box. Choose the right output format for the target file in “Save as type” combo box. You can download docPrint Pro at http://www.verypdf.com/artprint/docprint_pro_setup.exe. It will be a good helper or assistant in your office work, which can save you a lot of time and energy. How to append PDF pages and convert RTF to PDF? How to convert doc to eps using Document Converter?